why-ace-location ACE Adventure Resort is a private 1,500-acre mountain hideaway that has the most impressive array of on-premises adventures, activities, lodging and amenities of any Adventure Outfitter in the East! We are the only one located in the "Grand Canyon of the East" - the New River Gorge National River - giving you an exclusive "River-To-Rim" experience to one of our National Treasures. Located three miles away from the highway and traffic noise, our spacious facility maximizes your privacy and surrounds you with the great outdoors. why-aceadventureA world of adventure in one place means no driving, no waiting... just endless fun activities and adventures in one all exclusive 1,500-acre "Adventure Play Park". "Only At ACE" has become our motto and goal - we don't want to be like everyone else. The other "outfitters" try to claim that they're the "best" or "premier" outfitter, but when you compare - we believe you'll see the difference. Featured on the Travel Channel as North America's Largest Adventure Resort - we have more on-premises activities and adventures than any one else. why-acebestww "Wild and Wonderful" West Virginia mountains are adorned with pristine streams and mighty roaring rivers. ACE Adventure Resort has been the #1 rated Adventure Outfitter in the state for more than a decade, providing premier river adventures through the "Grand Canyon of the East" - the big-water New River and the non-stop, adrenaline pumping action of the "Beast of the East" - the legendary Gauley River for over 30 years. 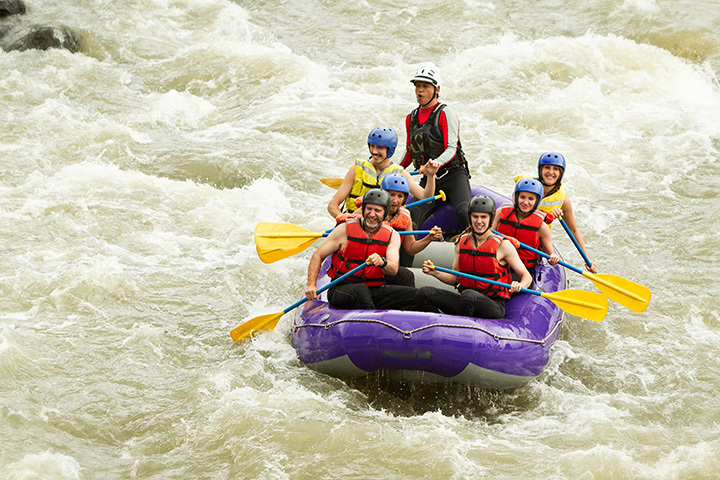 Within a 30-miles radius of our resort, thrill-seekers will find four designated National Rivers and over 100 miles of whitewater to explore - a concentration of whitewater found nowhere else in the U.S. With over 30 different trips from mild to wild and more access points than anyone else - we can ensure the highest quality experience over any other outfitter. why-ace-aminities Special care has been taken to design and refine our amenities and adventures over the years to accommodate most any age and group size. We feature the most diverse lodging options in the area - everything from simple to wow! Don't worry about the food - our casual Lakeside Dining Lodge is the perfect place to relax and enjoy the freshly prepared meals with your favorite beverage and dessert. Our lakeside Lost Paddle Bar Grill is the perfect setting for nighttime entertainment. why-ace-lake There is nothing like it in the state! Just about everything at our base camp centers around our unique, spring feed, 5-acre play lake. Words alone can't do it justice - watch our short two-minute video and see for yourself why it is one of the most popular features at our base camp. And did we tell you... it's included (with every adventure package booked at ACE you receive a half-day pass - believe us, a half-day of playing on the lake will help out even the most adventurous have a good night sleep). why-ace-freeactivities We never stop thinking of new ways to maximize your experience with ACE. With 1,500-acres (the next closets outfitter has 156 acres) we have plenty of room to expand our industry leading, on-premises, list of activities. Bring your mountain bike, or go hiking on miles of private trails. You can discover beautiful waterfalls, "ooh" and "ah" at our numerous overlooks of the gorge, relax or fish at our private lakes or explore the ruins of some of the old ghost towns from a bygone era in and around our property. Since our property is located within the New River Gorge you can link up with the National Park trails for endless exploration. why-ace-bestprice We have worked hard to earn the distinction as being West Virginia's #1 rated Adventure Outfitter in the state. Guests realize that their hard-earned recreation dollars are best spent with a respected and experienced outfitter with more quality adventures and activities than anyone else. Instead of contracting out services to the lowest bidder, we've assembled a team of over 200 dedicated people so each aspect of your experience can meet our high standard. From office staff, guides, food service, lodging, transportation, kayak, rafting, climbing, biking and horse services, our team does it all. As you will find it pays to go with the highest quality Adventure Outfitter. why-ace-equip ACE Adventure Resort has been the industry leader and innovator when it comes to outdoor adventures and it requires top of the line equipment and knowledge. We were the first with self-bailing rafts - we now have a full fleet of specially designed rafts. When you offer Zipline Canopy Tours, Ropes Courses and other technical adventures, you better know your stuff. We have full-time professional inspectors that do nothing else but inspect our equipment. why-ace-staff "Our Goal Is To Exceed Your Expectations!" Our professional and friendly staff is why more guests choose ACE as their Adventure Outfitter of choice than any other. Adventure activities are people activities - it takes a special type of person to guide a raft down a river or set up a rope system and man it as you zip through the trees. We can't afford to just have anyone working for us. We have rigorous certified training programs and review systems that are unparalleled in the industry. They must be the best to work for ACE. We have this commitment of excellence on all levels of staffing - not just our guides. why-ace-dream For more than 30 years we have been committed to the "total" guest experience. Outdoor adventures and sharing them with others is our passion. When we aren't out playing on our own - we are planning for the next one. During the winter months, we love to sit in front of the computer and research and dream of the next great adventure we can add to the long list of ACE Adventure Resort activities. It took a lot of hard work to get to the top, and we know it is going to be even harder to stay there... but it's fun trying!